Tony Romo and Candice Crawford’s Newborn Son’s Nursery: See the Photos! Tony Romo and his wife, Candice Crawford Romo (co-founder of Hawk + Sloane), welcomed baby Jones on August 23, and Us Weekly got an inside look into his adorable new nursery. The mother of three chatted exclusively with Us about her interior design decisions and raising three boys (Hawkins, 5 and Rivers 3). See Tamera Mowry's Son Aden's Baseball-Themed Nursery! Us: Was there a color scheme or aesthetic you were looking to create when designing your nursery? Romo: We came across the wallpaper and it really inspired the color scheme of the room. My favorite aesthetic style is to combine and use bright colors with natural elements. Us: There is a lot of white and brightness in the room. Why was that important to you? Romo: We always use white as a base in every room because above all I like rooms to look clean and crisp underneath the design elements. Us: There are a lot of different shapes in this nursery. What was your reasoning behind that? 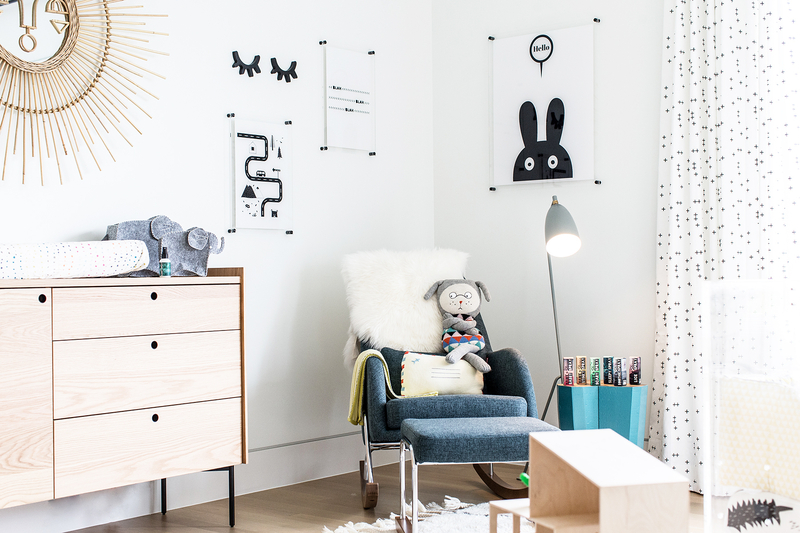 Romo: I think it is common for traditional nurseries to have shapes and geometric pieces, but we had fun scattering them throughout the room with a modern twist. One of my favorite “shapes” of the room is the custom built wooden bed frame. I think it encompasses a lot of the personality of the nursery. Us: I see you have a crib and a regular bed in the room. What was your decision behind that? Romo: The room is quite large and we were lucky to be able to accommodate space for both the crib and “big boy bed” in the nursery. I think down the road it will help with the transition from his crib to the bed as well and make for a great spot for reading and resting time with his big brothers. Us: There is a lot of Hawk + Sloane spray on the table? Why do you love it? What scent is your favorite? Romo: Hawk + Sloane is a line of sprays created by my best friend and I. We love our line because each spray serves a purpose to make some of the common hurdles of parenthood a little easier. All of our sprays are user friendly, great on the go, infused with essential oils and have helped so many kiddos and babies along the way! One of my favorite sprays is Sleepy Spray because it has the scent of lavender and really helps my boys and even me get restful sleep. Us: There are a lot of animals in this nursery, especially bunnies in the room. What was your decision behind the wall art? Romo: With tremendous help by Debra Owens, my interior designer, we fell in love with so many different wall art options. I like our kids’ rooms to have character, embrace their youth and overall be happy and fun and I think through the art on the wall, we are really able to accomplish that. Us: How is Jones doing? Is he sleeping through the night? Romo: Jones is GREAT! He really is such a wonderful baby and he has been sleeping so well! We are so grateful and it helps that he is as cute as a button too! Us: How are your two boys doing with being big brothers? Do they try to “help” you? Romo: [They] are the best big brothers! We included them during the whole pregnancy so they were really preparing and thrilled once Jones made his debut! They both are very attentive, check on Jones and are patiently waiting for him to be able to “play” with them! Us: Are you and Tony taking turns on diaper duty? Romo: Like when we had our other boys, together we put in equal efforts and sleepless nights and Tony is right there with me during it all… and yes, even when it comes to diaper duty! Us: What is your favorite thing about having 3 boys, and your favorite thing about being a mom? Romo: Being a mom of three is busy: juggling a newborn, a kindergartener and two of the three boys in sports fills up the activity schedule pretty quickly! It has its moments, but the greatest gift of being a mom is learning through the process and seeing how three boys are shaping me for the better every day. I love that they are active, enjoy playing, reading and learning new things so as a mom, they really keep me on my toes!